The expected attendance of about 150,000 was more than achieved and accommodated well in the town and area while the organisation of the first year’s event was superb with the overall impression being that Ballina did itself proud with a great fleadh. The spending was anyone’s guess but people in business and in banking said the £7m. estimate could be exceeded. Coverage of Ballina and the area on many of the World’s best known television and radio stations - which will continue for months - should give Ballina, Mayo and Ireland, a big tourism spin-off in years to come. Competitions all during the week attracted a very big number of young competitors and, indeed, the important musical ingredient in the weekend was dominated by young people who displayed their superb talents all over the place. Ollie Rouse, President of Ballina Chamber of Commerce, said he was delighted that Ballina had come up trumps. We should be very proud of ourselves that the town of its size could host an event of this kind and could do it so well. Mr Rouse said he was delighted also that there had been no trouble in the area for the weekend and that the critics and the rumour mongers had all been proved wrong. 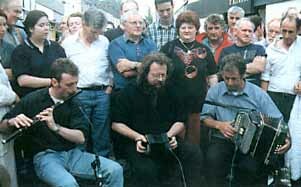 The fleadh was enjoyed by everyone who came here whether they were competitors, young people at Eigse, or people who like Irish music and wished to enjoy themselves for a few days in a carnival atmosphere. He added that the fantastic fireworks on the Sunday night meant that the Fleadh ended with a bang and that Ballina went out with a bang. Eamonn Walsh, Fleadh PRO and the man who launched a campaign to get the Fleadh to Ballina two years ago, said the Fleadh in Ballina had been the mother of all Fleadhs. Spread over the three days there were 170,000 people in Ballina and all of the Comhaltas Ard Comhairle have given top praise to Ballina. There were some hiccups but allowing for the fact it was a new town for the fleadh it was most successful and everyone is happy with it. There were many exceptional highlights in Ballina, the attendance of the President, the pageant and fireworks, the dome and the hospitality and friendliness of everyone.